Is there a better alternative to Iguania? Is Iguania really the best app in Image Editing category? Will Iguania work good on macOS 10.13.4? Iguania is a whole new intuitive way to enhance, grade and colorize your photos for printing, web, email or any other use without the need to use sliders. All you need is your mouse to adjust your images using this whole new set of tools. Watch our screencast at www.iguania.net to get you started. 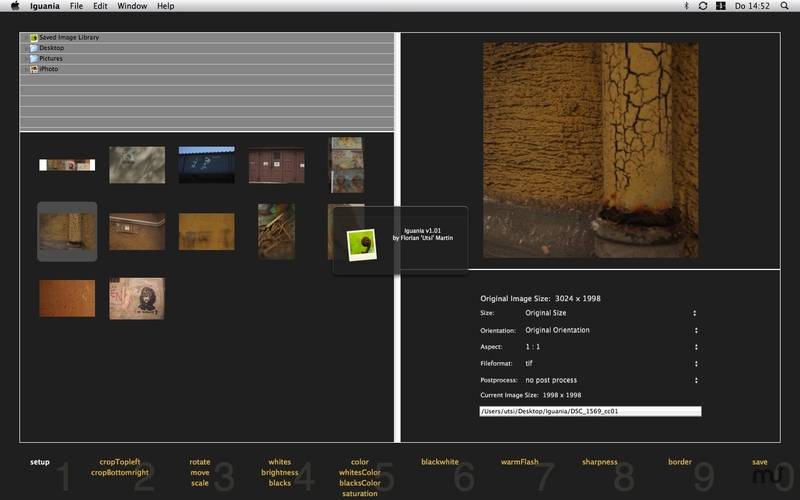 Visual History ( New Feature ): Iguania remembers all the settings you have ever applied to an image in its own database. An icon bar on the left of the user interface visually presents these "settings" to you, so you can apply these again or use them for comparison. Iguania needs a rating. Be the first to rate this app and get the discussion started! New improved Color Filters ( New Feature ): Now you can adjust the mid tones, highlights or blacks individually with all new reworked filters, to give you the best grading tools for your photos. Comparing Images ( New Feature ): To compare your current image with any other image or setting, just click any icon from the icon browser. New improved User Interface: The user interface has been improved to better use your screen size. New big cursors help you to quickly see what you can do with the mouse at any stage.